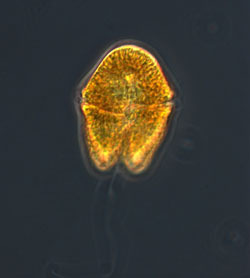 This dinoflagellate (above), known as Akashiwo sanguinea, was identified as the source of the substance that fouled the feathers of birds in Monterey Bay in 2007. 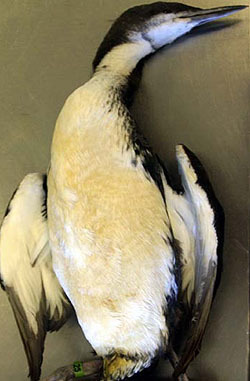 The yellow-green staining of breast feathers seen on a Pacific loon (below) found dead in Monterey Bay was typical of over 700 marine birds affected by the red tide event. Photos courtesy of R. Kudela. In late 2007, hundreds of dead and stranded seabirds washed up on the shores of Monterey Bay, their feathers saturated with water and coated with an unknown substance. After an intensive investigation, scientists determined that a massive "red tide" bloom of marine algae had produced a foamy soap-like substance that stripped the natural waterproofing from the birds' feathers. This is the first documented case of its kind, but similar events may have gone undetected in the past, the researchers reported in a paper to be published in the online journal PLoS ONE on Monday, February 23. "The problems we traditionally associate with harmful algal blooms are caused by toxins produced by the algae. In this case, it was a surfactant that removed the water-repellent properties of the feathers," said Raphael Kudela, professor of ocean sciences at the University of California, Santa Cruz, and corresponding author of the paper. Although this red tide bloom was nontoxic, it was very harmful to the affected birds, which included grebes, loons, northern fulmars, and surf scoters. Live birds found stranded on beaches around Monterey Bay were starving and severely hypothermic, having lost the insulation normally provided by their waterproof plumage. A total of 550 birds were stranded alive and 207 were found dead during this event. Kudela teamed up with researchers from the California Department of Fish and Game (CDFG), Monterey Bay Aquarium Research Institute (MBARI), and Moss Landing Marine Laboratories (MLML)--all members of the Central and Northern California Ocean Observing System (CeNCOOS)--to investigate the mass stranding, which occurred at the same time as the Cosco Busan oil spill in San Francisco Bay and an ongoing controversy over aerial spraying on the Central Coast to control the light brown apple moth. "There were a lot of questions at the time about whether the stranding was related to those events, and we were able to eliminate those possibilities," Kudela said. The dominant species in the red tide was a type of dinoflagellate known by the scientific name Akashiwo sanguinea, which has caused red tides in the past without harmful effects on wildlife. Kudela said the problems in 2007 resulted from the unusual combination of a large red tide late in the year, when large numbers of migrating birds had arrived in the area, plus big waves that churned up the water. An algal protein produced the slimy foam that fouled the birds' feathers. Its effects were similar to those of soap and other surfactants that are used in detergents to dissolve grease. Wave action contributed to the problem by breaking up the cells of dying algae and churning the dissolved protein into the thick foam that was seen along the shoreline and floating on the surface of the water. "We grew the algae in the lab, and when we shook it up it produced the same foam," Kudela said. "The waves act like a blender, churning up the cells and the protein." These kinds of events may occur more often in the future, he said. The researchers noted that the frequency, size, and duration of red tides have increased substantially within Monterey Bay since 2004, and similar increases are occurring elsewhere in the world. These changes are probably due in part to the effects of climate change on surface water temperatures, Kudela said. "Starting in 2004, we have had big red tides with greater frequency than in the past," he said. "Although 2007 was the first time we saw an impact on birds, the conditions are there for the same thing to happen the next time we have that combination of red tide, birds, and big storm waves." The authors of the PLoS ONE paper include David Jessup and Melissa Miller at the CDFG Marine Wildlife Veterinary Care and Research Center in Santa Cruz; John Ryan and Heather Kerkering at MBARI; Hannah Nevins at CDFG and MLML; Abdou Mekebri and David Crane at the CDFG Water Pollution Control Laboratory; and Kudela and Tyler Johnson at UCSC. This research was partially funded by the National Oceanic and Atmospheric Administration (NOAA) through the Monitoring and Event Response for Harmful Algal Blooms (MERHAB) program. MERHAB funds the California Program for Regional Enhanced Monitoring of Phycotoxins, which provided support for this research. Note to reporters: You may contact Kudela at (831) 459-3290 or kudela@ucsc.edu.